recently darling and me went to see Skyfall, so I wanted to make James Bond themed nails. As my nails are quite short lately, I decided to go for a black and gold glitter gradation. 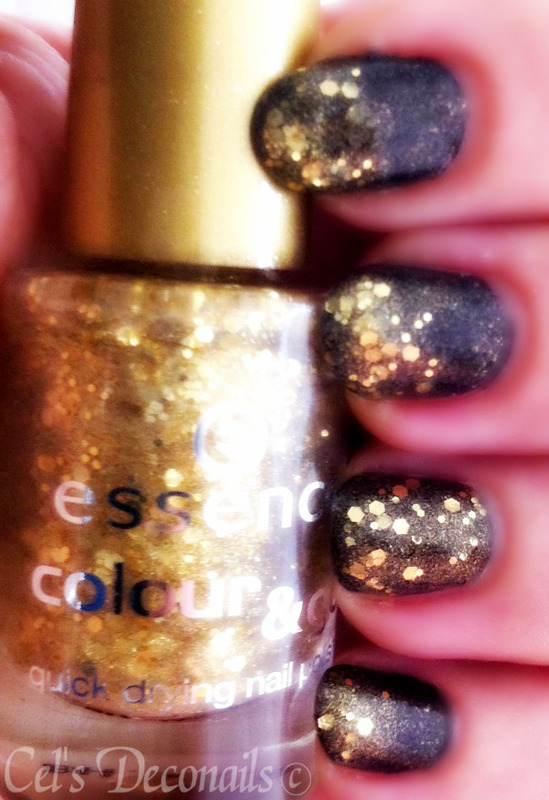 Black because in my opinion it's Bond's colour and gold because my favourite James Bond movie is Goldfinger. 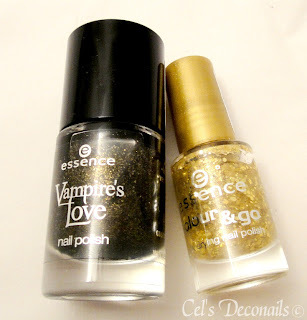 I used Gold Old Buffy from the Essence Vampire's Love trend edition which is a black nail polish full of gold micro glitter and Make it Golden from the Essence colour & go series which is full of gold glitter of every shape and size. 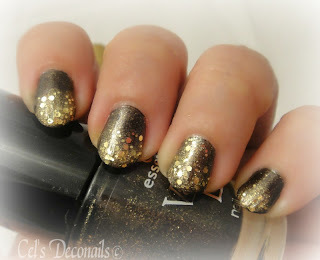 I did an accent finger full of gold glitter and the gradation effect on the rest of my nails. Sealed everything with Seche Vite and I was good to go. What I really loved about Make it Golden was that it was very easy to apply. 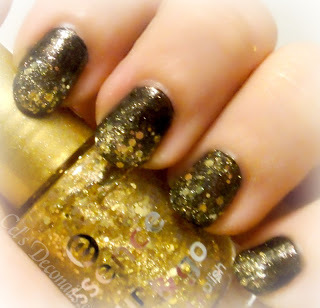 Usually glitter nail polishes are troublesome as the glitter particles have to be moved around with the brush or an orange stick for full coverage. But this was not an issue in this case. What about you dear readers? Have you watched Skyfall? Did you do a matching manicure? την ταινία δεν την έχω δει αλλά τα νύχια είναι ΤΕΛΕΙΑ! Γουάου! Μόνο αυτό μπορώ να πω... μου αρέσει τρελά ο συνδυασμός, πήρα και εγώ ενα χρυσουλί βερνίκι της essence και νομίζω θα περάσω πολύ καλά μαζί του, χι χι . Την ταινία δεν την έχω δει ακόμη, έχω μια λίστα με ταινίες που θέλω να δω, περιμένω να κλείσουν τα σχολεία και να αναλάβουν οι γιαγιάδες τα μικρά. I have not watched the Bond film, but I do adore the mani you have done. Essence's make it golden and its cousin time for romance are two of the best glitter polishes in the world. I think I'll go do a full make it golden mani to see how it looks like. I haven't seen a Bond movie in quite a while, though I do enjoy photos of Daniel Craig. :) That Essence looks great--I don't think we ever got that one at my Ulta.